Speaking to many long serving Canberra technology & consulting professionals, there’s a general sentiment that the market conditions here are as positive as they’ve ever been. I’ve heard quoted on a few occasions that “If you’re in IT services or consulting in Canberra and not experiencing growth in your business, then you’ve probably got to question your capability”. In saying this, there are definitely challenges associated with buoyant markets and Canberra is no different. CRM – The CRM market is always hot in Canberra, with MS Dynamics completely dominating over the past few years. I haven’t heard of many successful implementations where significant customisation has been required versus taking it from the box and re-engineering business process. Look for Salesforce.com to penetrate this lucrative market over the next few years. Salesforce accounts for 19.6% of the CRM market worldwide, with its nearest competitor being Oracle at 7.1%, interestingly Microsoft ranks fourth. Cloud – It’s hard to not include ‘cloud’ in most tech conversations in Canberra. Although a few years behind the rest of the world in terms of cloud adoption due to the restricted data requirements of Government, it is gaining more and more momentum as hosting providers gain ASD certification to host ‘protected’ level data. MS Azure is off and running with its recent ‘protected’ certification and once AWS catch up, it’s hard to see how other competitors will keep up with the sheer power, technology and size of these global leaders, maybe Google Cloud??? The other big barrier to cloud adoption is the Government’s traditional commercial and budgeting model. Budgets need to account for ongoing monthly cloud consumption and subscription costs in operational not capital budgets, which appears hard for Departments to understand after years of building software with capital expenditure. In years to come, the majority of software used will be cloud based COTS products rather than bespoke developed. Panels & Procurement – The DTA is attempting an overhaul of government technology associated procurement. In August 2017 I attended an industry briefing where Angus Taylor (Assistant Minister, Digital Transformation) launched the findings and recommendations generated by the ICT Procurement Taskforce. The key component of the reform was that all Government ICT contracts are to be capped at $100 million in value or 3 years in duration. During the briefing it was highlighted by the audience that most managed service deals don’t tend to make profit in the first couple of years whilst they set up, bed down structure, process etc and typically only become profitable in year three and onwards. From here, Angus was questioned as to how the Government would allow for this under the new reform, to which he answered slightly squirmishly, “Well there may be some exceptions”. It was at this point where the reform lost a fair amount of credibility with the private sector briefing attendees, an example of the disconnect between public and private sectors that we often experience in the nation’s capital. I guess we’ll wait and see how that one plays out. The other notable procurement-related thing is how the DTA will attempt to reduce the barriers to entry of emerging tech players. There’s a lot of rhetoric out there around the encouragement of innovation, small business, initiative etc., being a small business that has recently entered the Canberra market I can certainly vouch that unless you’re on some of the core panels, you’ve got little chance of directly transacting with Government. Even established US tech product vendors struggle with Government procurement when it comes to their inflexibility around panels. In its current state, the Digital Marketplace is far from an effective tool for both the seller and buyer, if you’ve seen the user interface you’ll know what I mean. DTA has now assumed control of the Cloud Services panel and others, so it’s expected a more open-market policy will eventuate. Defence’s MSP panel will kick off very soon and see a small number of consortiums soak up a lot of the big-ticket defence programs of work, with a lot of the smaller project work to run through the DoD DSS panel. The DHS ICT Contractor and Services panels both expire in August 2019 which is music to the ears of a number of firms that have come into the market within the last six years, including yours truly. 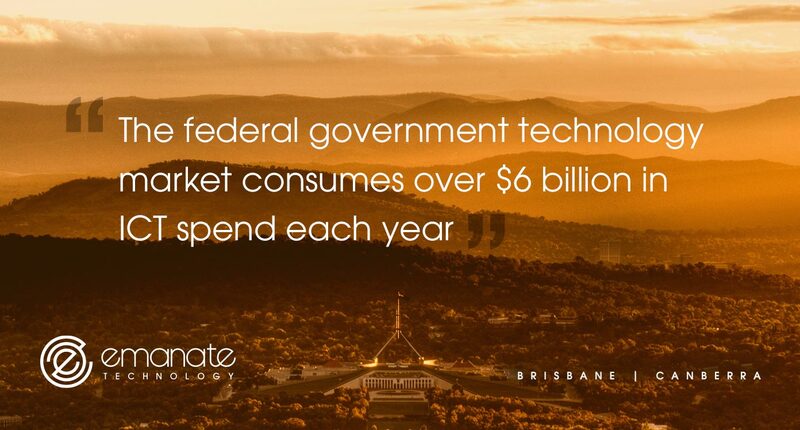 New Players – large Australian and Global corporates see the potential in a government technology market that consumes over $6 billion each year. The likes of AWS, Salesforce, Red Hat etc are heavily investing in Canberra, no longer is it almost purely a Microsoft town. There are a number of local technology and consulting firms that have seen great success in recent years prior to being acquired by larger ASX listed firms looking to penetrate the government landscape, examples including the DWS purchase of Projects Assured and Cirrus Networks acquiring Correct Communications. ACT Gov – ACT Shared Services seems to be quite a successful example of centralising core technology services across departments, something that the Feds seem to struggle with. They have stated that within 5 years the ACT Government tech environment will be ‘tin free’ and completely cloud based. The big spend over the next year will be a revamp of all ACT Health’s systems to the tune of $40 million. DTA – it will be interesting to see how (or if) they manage to gain significant relevance. One of their stated core priorities is to review costs, benefits and status of all projects and programs worth more than $10 million. Can you really see the DTA getting involved and asking questions in Defence or DHS ICT projects? Where were they when the recent ACIC Biometrics program went belly up? I find it very difficult to understand how, in its current state, the DTA would have the resources required to play this role across government. It seems, as they continue to search for their place in town, they fall into the trap of declaring objectives that seem far from reality, which will see their credibility suffer. Here’s hoping its new leadership team shrink down their focus and try not to be the solution to all problems. Shared Services – conceptually creating centralised technology organisations to supply services to other government agencies sounds very logical and efficient. The challenge however seems to be a lack of well thought out execution, executive sponsorship & accountability, along with the commercial mindset required to deal with differing agendas, needs and expectations across organisations. In examples I’ve been exposed to, it often seems that the service provider will sing the virtues of these initiatives however it’s the customer-side recipient that has not experienced benefits and often resulted in duplication of roles and increased costs. I expect we’ll see more of this in town and it will suffer the same teething problems outsourcing did during the early 2000’s. Eventually we’ll figure it out though. Overall, government technology is in an exciting phase. There appears to be a new wave of more progressive CIO’s at the helm driving the adoption of new technologies and business focused initiatives. As always with government, their success will hinge on effectively navigating bureaucracy and politics as well as reforming old-school budgeting and commercial models, not to mention the availability of talent.